Cpl. 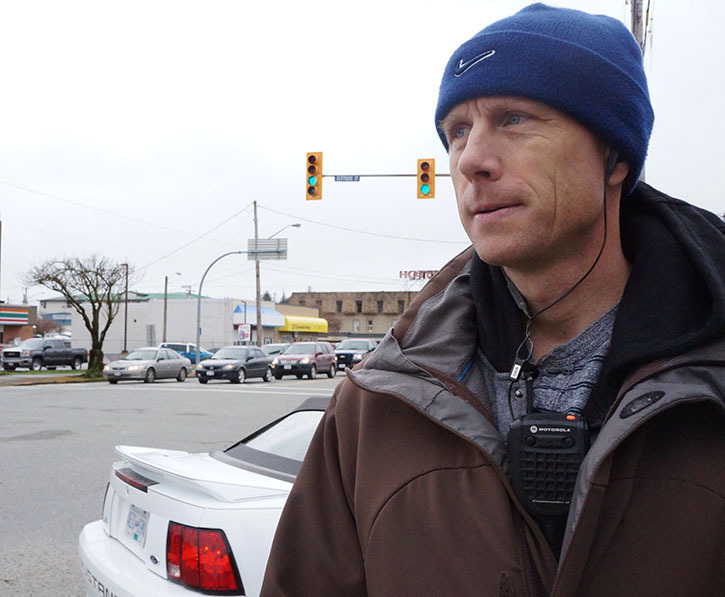 Michael Elston of the Central Can Island Traffic Services patrols the Johnston Road and Gertrude Street intersection for distracted drivers on March 11. Mar. 11, 2016 6:00 a.m. Distracted driving is the second leading cause of car crash fatalities in B.C. with an average of 81 people killed each year, 10 of which are on Vancouver island, said an ICBC road safety coordinator. Central Vancouver Island Traffic Services, Port Alberni RCMP and Nanaimo Integrated Road Safety Unit conducted a Distracted Driving campaign at the Johnston Road and Gertrude Street intersection on Friday. Officers were undercover in plain clothing patrolling for distracted drivers using their cellphone while behind the wheel. Several police vehicles were spread out in the area waiting for radio calls from the undercover officers with descriptions of the alleged distracted drivers in order to pull them over. “Within a five-hour time period there were 33 infractions noted including 14 for distracted driving specifically related to the use of electronic devices,” said Cpl. Micheal Elston, Central Island Traffic Services, who was patrolling the intersection on Friday. Elston said distracted driving tickets will cost the driver $167 and three points. Elston said the Johnston-Gerturde intersection was the choice location for patrolling distracted drivers because of the busy nature and high volume of traffic in the area. Caroline Robinson, ICBC road safety coordinator, said ICBC conducts two campaigns a year, one in March and one in September, to remind people about the dangers of distracted driving. Robinson said Citizens on Patrol volunteers from Port Alberni, were also spread out around town on Friday educating people on the dangers of distracted driving. “Port Alberni’s very great that they have such a wonderful group of volunteers to help out in other locations doing education and observational survey,” she said. Driving is very complex and no conversation is important enough to do while you’re driving, Robinson said. “We understand phones are very important to people and we’re very attached to them, but there’s a time and a place and it’s not behind the wheel,” she said.